Keeping your dog busy during cold winter months can be a difficult task. With a little planning and a few ideas, you can train your dog indoors to keep them physically and mentally fit when it’s too cold to spend much time outdoors. Teaching your dog these indoor games can help make other training activities easier and can engage your dog’s desire to learn and be challenged. These games are especially beloved by smart dogs and working breed dogs. They fulfill an essential need in these pups. Puzzle-type games can also help break up doggie boredom that can set in when pups are cooped up indoors due to inclement weather. Try these four indoor doggie games and see which your dog enjoys: hide and seek, towel treats, which hand, and scavenger hunt for dogs. If your dog doesn’t get all four games or shows little interest in one or more, no worries. Just focus on the ones they do like and enjoy your time together. Special games that involve teaching your dog to use their nose on command are called scent work. These types of games and training are often used to train diabetic alert dogs and search and rescue pups. Even if your dog will never become a full-fledged service dog, they can enjoy using their natural talents to learn some scent work basics. You can start with these easy scent work games in the videos below. This game is sometimes referred to as nose work, because your dog uses their nose to do the work to find the particular scent used during the training. Here’s how to get started with basic scent work training. You can turn basic scent work into an indoor game to keep your dog busy indoors, then move to outdoor training once the weather breaks. Changing up the area in which you train can add extra excitement for your dog. Please note, never hide scent toys anywhere you don’t want your dog to frequent, like off limit rooms of the house, kitchen counter tops, dinning tables, or dangerous areas. All scent work games should be supervised as dogs can find potentially dangerous items during the search. If your dog becomes frustrated or bored, simply redirect their attention back to the game or in a new direction. You can always abandon a session if needed and go back to something more familiar like a game of ball. If you’re serious about continuing scent work with your dog, you can invest in a professional kit or make one of your own. A popular version is to purchase a length of plastic PVC pipe with screw on ends. Drill a few scent holes in the pipe and hide your scent inside for a DIY scent work toy. You can even sign up for a program sponsored by the American Kennel Club to help get you started with all levels of experienced pups. The freeze-dried​,​ versatile supplement that contains ​simple ingredients packed with powerful nutrition. 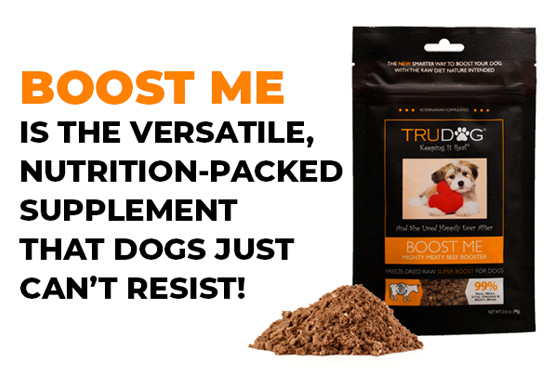 Boost me enhances​ the nutritional value of your current dry or wet food, and ​is an excellent choice for ill or ​senior​ dogs, finicky eaters,​ or a great way to transition to a freeze dried raw diet.